Painted Turtle Book, 9780814341322, 256pp. After several years as a small-town lawyer in Alpena, Frank J. Kelley was unexpectedly appointed Michigan's attorney general at the end of 1961. He never suspected that he would continue to serve until 1999, a national record. During that time, he worked with everyone from John and Bobby Kennedy to Bill Clinton and jump-started the careers of dozens of politicians and public figures, including U.S. Senator Carl Levin and Governors James Blanchard and Jennifer Granholm. 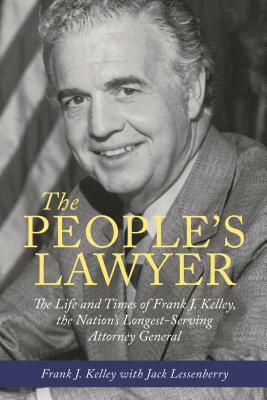 In The People's Lawyer: The Life and Times of Frank J. Kelley, the Nation's Longest-Serving Attorney General, Kelley and co-author Jack Lessenberry reflect on the personal and professional journey of the so-called godfather of the Michigan Democratic Party during his incredible life and thirty-seven years in office. The People's Lawyer chronicles Kelley's early life as the son of second-generation Irish immigrants, whose father, Frank E. Kelley, started out as a Detroit saloon keeper and became a respected Democratic Party leader. Kelley tells of becoming the first of his family to go to college and law school, his early days as a lawyer in northern Michigan, and how he transformed the office of attorney general as an active crusader for the people. Among other accomplishments, Kelley describes establishing the first Office of Consumer Protection in the country, taking on Michigan's public utility companies, helping to end racially restrictive real estate practices, and helping to initiate the multibillion-dollar Tobacco Master Settlement Agreement in 1998. Kelley frames his work against a backdrop of the social and political upheaval of his times, including the 1967 Detroit riots, the disappearance of Jimmy Hoffa, and the assassinations of John F. Kennedy, Robert F. Kennedy, and Martin Luther King, Jr. All those interested in American history and legal history will enjoy this highly readable, entertaining account of Kelley's life of public service. Frank J. Kelley served as Michigan's 50th attorney general. His 37 years in office, from 1962 to 1999, made him both the youngest (37 years old) and oldest (74 years old) attorney general in the state's history, and led to his nickname, the "Eternal General." He still holds the record as the longest-serving state attorney general in U.S. history. Kelley was the first state attorney general to establish both a consumer protection and environmental protection division. After his retirement from government, he co-founded Kelley Cawthorne, a prominent governmental affairs and law firm in Lansing, Michigan.Jack Lessenberry is head of the journalism faculty at Wayne State University in Detroit, the senior political analyst for Michigan Radio, as well as host of the half-hour public affairs program Deadline Now on WGTE-TV in Toledo, Ohio. He has had a long career in both print and broadcast media and won a 1994 National Emmy award for a documentary on Dr. Jack Kevorkian.